Namadwaar with its efforts in imparting value enrichment and culture awareness programs through Gopakuteeram having 80 students has attracted premier Hindu organization like Gita forum for the cultural events. 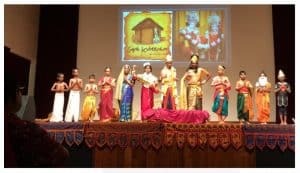 Krishna Manjari 2019 a cultural program of Gita Forum sponsored by Hindu Endowments Board invited Namadwaar to present a skit by GK children. Parents, children and GK teachers launched a skit on Bhaktha Prahalad. With only one month to finalize the script, to make audio recordings, soundtrack as well as make state of IT based back drops, GK teacher and parents were on the job swiftly with enthusiasm. Not to mention the making of props and deciding on the costumes the kids will be wearing as well as holding practices only during their weekly GK class. Grace of Sri Guruji was visible from the enthusiasm, commitment, taking minute care in acting, co-ordination and stage related matters, back stage arrangements. Mrs. Bhanu Sridharan from Namadwaar supported the logistics and stage support and Miss Shreya Sridharan from Namadwaar youth team made all IT based backdrop projections and sound systems. The show wouldn’t have been so grand without the unconditional support of the GK kids’ parents. Most of the props used in the Skit were handmade by the parents. Even the magnificent pillar standing at 1.8m in height was designed and constructed by one of the parents. 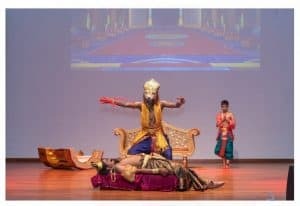 Around 500-600 people were present in the PGP auditorium, Sri Srinivasa Perumal temple on 9th March 2019. 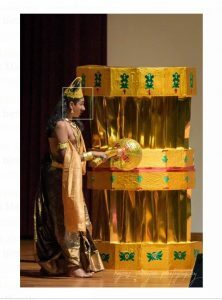 This skit on Bhaktha Prahalad was well received by the audience and many came forward to know more about our Namadwaar. Some parents even indicated their interest in enrolling their kids to GK classes. They received a very inspiring feedback from the organizers bringing all key areas of the skit which transformed the skit to be most impressive. None of these would have been possible without the immense blessings and grace of our beloved Sri Guruji, PremikaVaradhan and Madhurisakhi.